The Economist recently published an article called ‘what technology can do for Africa’. The article covers key discussions around the potential of technological development in sub-Saharan Africa, but falls into pitfalls common to the subject. Determinism is evident in emphatic statements like: “countries are on the cusp of a tech-driven transformation that is already beginning to make people healthier, wealthier and better educated at a pace that only recently seemed unimaginable”. Mobile phones are top of the list, said to have made ‘leaps’ possible. This pervasive image of Africa ‘leapfrogging’ stages of ‘Western development’ with mobile phones in order to improve health, education, communication and business is certainly compelling. But in reality, many digital development practitioners are increasingly skeptical of this utopian ideal, said to be Western-centric (Suchman, 2002, 2011; Tunstall, 2013; Nussbaum, 2010) and to result in unsustainable ‘pilots’ (Holeman, 2017; Huang et al, 2017) which can leave new gaps in their wake. The Economist article attempts to acknowledge this critique by countering optimism with evidence that the region’s infrastructure is increasingly “sluggish”. 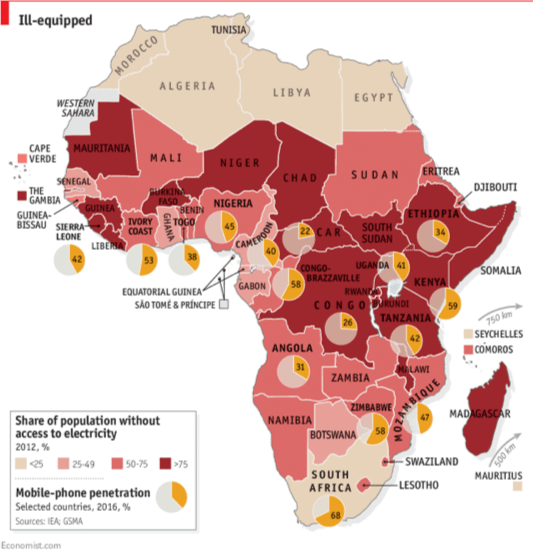 The below map of Africa is entitled merely ‘Ill-equipped’, and shows limited access to electricity and mobile phones across much of the continent; in Uganda, 25% and 41% respectively. Besides a few tech hubs, technological advancement and education are unfavourably contrasted with that of Silicon Valley and “the rich world”, from which “Africa risks falling even further behind”; implying a sense of failure, and of technology as a global race. Through 16-months ethnography in Kampala, I hope to find a different middle ground with a more considered optimism towards ‘what technology can do for Africa’, or instead, ‘what Africa can do for technology’. In the article, Liberian medic Dougbeh Chris Nyan is poignantly quoted to say: “We are forced to be inventive to become masters of our destitution”. In line with Katrien Pype’s exploration of the meaning of technological inventiveness in Kinshasa, ‘smart’ solutions are built around constraints and ‘from below’ (2017). For example, mobile money, “the bank account in your pocket”, a pertinent example of technology adapted to African requirements. How do people in Uganda appropriate mobile phones and mHealth to accommodate their preferences and needs? During my fieldwork, this question will direct an enquiry into the active role people take as users of technology. As evident in the pilots which do scale and survive, initiatives must begin and meet with sociocultural realities. Holeman, I. (2017) Human-Centered Design for Global Health Equity. Huang, F., Blaschke, S., Lucas, H., 2017. Beyond pilotitis: taking digital health interventions to the national level in China and Uganda. Glob. Health 13. Suchman, L., 2011. Anthropological Relocations and the Limits of Design. Annu. Rev. Anthropol. 40, 1–18. Suchman, L.A., 2002. Practice-Based Design of Information Systems: Notes from the Hyperdeveloped World. Inf. Soc. 18, 139–144. Tunstall, E. ‘Decolonizing Design innovation: Design Anthropology, Critical Anthropology and Indigenous Knowledge’. In Gunn, W. Otto, T. Smith, R. (2013) Design Anthropology: Theory and Practice. Bloomsbury Publishing, London.